135,502 passengers travelled to the region (AGP/XRY) from Berlin's airports in 2012. Germany is the region's 3rd busiest country market. 168,850 passengers travelled from BIO to the region in 2012. In addition to attracting inbound traffic, the northern Basque region could become a visitor attraction for the local catchment area. 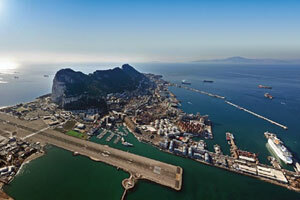 The UK's South West region remains unserved from GIB, yet 273,060 passengers travelled to AGP in 2012. Only 10% of this traffic travelling to the GIB catchment area would equal 27,000 passengers yearly. 328,494 passengers travelled to the region from BRU in 2012. In addition, 1,438 are resident in the area with GIB as their closest airport. Close links have always existed between Gibraltar and Morocco thanks to its proximity. The Government of Gibraltar has recently embarked on a new drive to promote inbound tourism and two way business links between Gibraltar, in addition to relaxing visa requirements for Moroccan nationals into Gibraltar. The possibility therefore exists for services to the north African kingdom allowing for a mix of both inbound and outbound traffic. In addition, there are over 13,000 Moroccan nationals resident within a 60 minute drivetime of Gibraltar, increasing the traffic potential. Business opportunities could be generated. 203,592 passengers travelled CPH-AGP in 2012. A 10% market share would equal up to 20,000 passengers CPH-GIB, potentially being the closest airport to their final destination in the region. Demand for city break tourism could also be stimulated, as well as both inbound and outbound and business links generated. The Port of Copenhagen is also one of the busiest in the Baltics. 435,693 passengers travelled AGP-DUB in 2012. There are 1,229 Irish nationals registered as resident within a 60 minute drive from GIB, nearly 4,000 in Malaga and Cadiz provinces. A 10% market share of traffic could mean up to 43,000 passengers yearly DUB-GIB. 193,911 passengers travelled to the region in 2012. There are also 5,490 German nationals resident within a 60 minute drive of GIB. The area of Tarifa is very popular with the German market and this is only 45 minutes from GIB, the nearest airport by far. Business opportunities could be generated with direct air links. 81,344 passengers flew to the region in 2012. The northern German city has a strong maritime business thanks to its Port, one of the busiest in the world. Maritime business opportunities exist thanks to Gibraltar's growing Shipping Register, complemented by city break tourism to Gibraltar and access to the region. The Port of Algeciras, across the Bay of Gibraltar, is a major container port. 184,915 passengers travelled HEL to the region in 2012. Gibraltar could become a city break destination, especially in the winter months, in addition to being a complimentary alternative airport to the region, as well as providing easier access than AGP to the Costa de la Luz. 230,621 passengers travelled LBA-AGP in 2012. The Yorkshire region also remains unserved from GIB. A 10% market share of traffic would equal up to 23,000 passengers yearly. Two way leisure traffic could be generated for both Gibraltar and Lisbon as city break destinations, in addition to allowing access to the entire region. Business links could be generated thanks to direct air services. 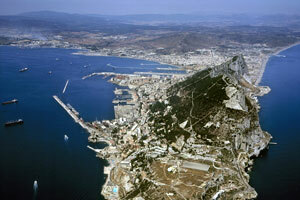 The City of London enjoys strong business links with Gibraltar and could also attract citybreak tourism to 'The Rock'. London is currently the largest market to GIB. 160,027 passengers travelled NCL-AGP in 2012. The North East UK is another unserved region from Gibraltar. 171,899 passengers travelled OSL-AGP in 2012. Gibraltar has an internationally recognised shipping register, in addition to providing a variety of maritime services thanks to its location at the entrance to the Mediterranean. City break tourism and access to the region add to the opportunities. The French capital is a busy destination from the region with 440,664 passengers in 2012 (CDG-AGP 5th busiest route). 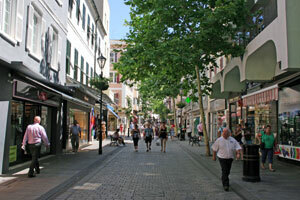 There are 3,072 French nationals registered as resident within a 60 minute drivetime from GIB. A 10% market share could equate to 44,000 passengers yearly CDG/ORY-GIB. Top of the Rock? You'll feel on top of the world! Africa to the south and Spain to the north, the view from the top of 'The Rock' truly highlights the airports potential as the arrival gateway for the region. 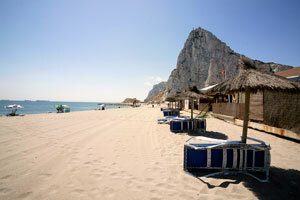 An ideal short break destination, Gibraltar offers major UK and international high street and exclusive brands. Relax whilst enjoying the culture, cuisine, marinas and military history or why not get married? 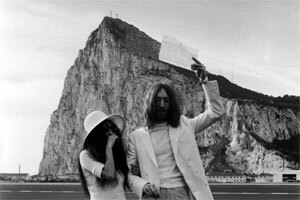 John Lennon and Yoko Ono did. Visitors can marry without statutory residential requirements and couples can complete the necessary paperwork in advance of their trip. 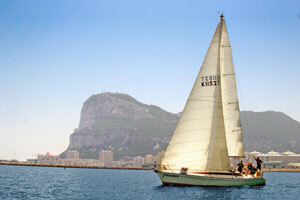 Gibraltar is an ideal short city break destination filled with natural historic, cultural and military history, marinas and leisure activities. 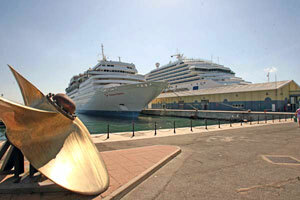 It is also an important and popular stop for the cruise liner market with over 185 visits planned for 2013. ‘The Rock’ is also an International Finance Centre fully regulated to UK and EU standards, creating business traffic potential. 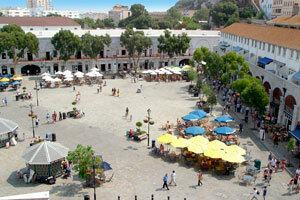 Gibraltar’s GDP also ranks high, with GBP35,589 per person in 2011. Port Activities: The port of Gibraltar is an important ship bunkering and crew change centre, given the natural location at the entrance to the Mediterranean. A system wide load factor for 2012 of 87.2% – all destinations are currently served year round. GIB also has a less pronounced seasonality than the regions’ other airports, highlighting its difference to the traditional ‘holiday’ airports in the Iberian peninsula. MICE – A growing sector thanks to Gibraltar’s compact size. Meeting points and attractions are all easily accessible in a safe and contained environment. There is also an abundance of unusual settings for product launches or meetings with a difference. Gibraltar Airport is the natural access point for Gibraltar, the Western end of the Costa del Sol and the eastern end of the Costa de la Luz. In 2011 61% of air arrivals continued their journey into the region, a complimentary alternative to the region with its own unique market opportunities. 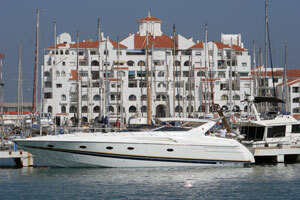 The Costa del Sol and Costa de la Luz are major international leisure markets. The Costas’ boast of more than 120 miles of Mediterranean and Atlantic coastlines. The Costa del Sol is also known as the Costa del Golf. 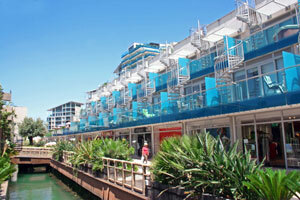 Marinas, Hotels and the second homes market compliment. Potential for year round service. There is also a large diaspora of European nationalities resident in the region and within a 60 minute drivetime from GIB. In addition, the area has a large second homes market, attracting repeat travel in addition to VFR traffic year round. 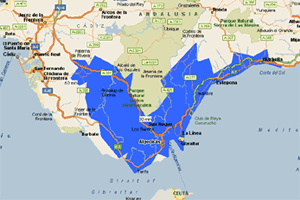 The immediate catchment area remains unserved from Europe with all traffic destined for Gibraltar and the nearby towns and resorts having to endure a 90 minute drive from the regions’ other airports. Gibraltar International Airport is committed to the long term success and longevity of every route and will work with all carriers to ensure a profitable operation, providing a significant contribution to a carriers route network. Gibraltar International Airport works in close cooperation with the Gibraltar Tourist Board in the promotion of new services. Please contact us for further details of our schemes. Gibraltar’s unique catchment area can be seen above, enviably located at the meeting points of the Costa del Sol and Costa de la Luz. Whilst the dominant market to the region is South – North leisure, the added advantage of Gibraltar as International Finance Centre opens up the possibility of business traffic. In addition, the large second homes market and miles of beaches and activities make it the preferred playground for millions of visitors year round. With 18 golf courses within a 40 minute drive from Gibraltar Airport, including the world famous Valderrama Club, you’ll be spoilt for choice. 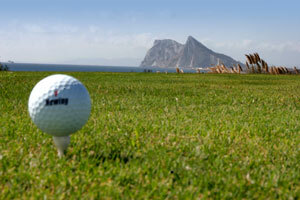 The regions’ 300 days of sunshine and mild climate has established it as a prime golfing area for year round activities. Gibraltar, Costa del Sol (Malaga Province) and Costa de la Luz (Cadiz Province), 587,000 inhabitants within a 60 minute drive. Naturally, inbound traffic flows dominate and these create the significant opportunities. Major markets into the region include the UK, Spain, Germany, France, The Netherlands and Ireland. Large overseas expatriate communities in the area increasing the outbound traffic potential. Excellent motorway links to the Autopista de la Costa del Sol. The railway stations of Los Barrios and Algeciras are only a short distance away. Opportunities now also exist in marketing Gibraltar as a short break European destination, or as a two or even three centre holiday with the Costa del Sol, Costa de la Luz or Morocco. Year round city break destination, unique in its offering. 300 days of sunshine a year, mild winters. Rich in history, natural history, entertainment, water based activities, tax free shopping. Only 6 minutes away from the airport, the port’s proximity make it ideal for crew changes and spare parts supply. Major bunkering port – The Port of Gibraltar is the largest bunkering station in the Mediterranean, which sees over 100,000 ships transit annually through the Straits of Gibraltar. Cruise Liner port – Gibraltar is in the itinerary of major cruise companies and is one of the busiest cruise liner ports in the Mediterranean. Planned calls for 2013 are 185 ships and 303,026 passengers (on full occupancy). Ship and Yacht Registry – This registry, growing year on year, is internationally recognised and considered high quality as registered ships would belong to a British flagged register. A growing sector in Gibraltar thanks to its compact size, meeting points and attractions are all easily accessible, making it an ideal location in a safe and contained environment. There is also an abundance of unusual settings ideal for product launches or meetings with a difference. Morocco is also easily accessible with regular ferry services from the region, allowing for multi centre holidays. There is a varied diaspora of European nationalities resident within a 60 minute drive, enjoying what the region has to offer but still requiring direct links to their countries of origin. An ideal arrival gateway. Arriving passengers can either remain in Gibraltar for a unique city break stay, or conduct business in Gibraltar, or continue onto the Costa del Sol or Costa del la Luz or cross over to Morocco via the frequent ferry services available from the region. 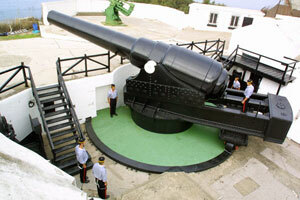 Situated at the southern end of the Iberian peninsula and traditionally recognised as the southernmost point in Europe. Spain to the North and Morocco to the South. 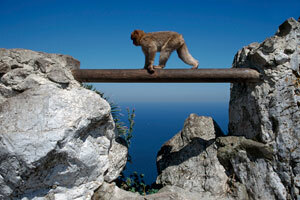 Natural access for Gibraltar, Costa del Sol and Costa de la Luz regions of Spain. The new airport terminal is only a 2 minute walk from the land border with Spain. In 2012, 61% of air arrivals continued their journey into the catchment area, highlighting the strength of the catchment area on existing services. 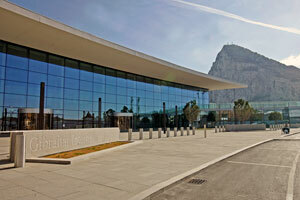 Completed at the end of Summer 2012, Gibraltar International Airports' new terminal building showcases the airport as an entry point to the region. 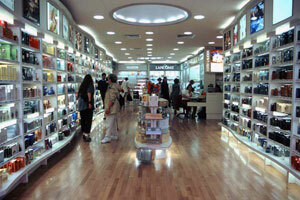 Spacious, light and friendly to navigate, it has all the facilities demanded by todays modern travellers. Quick taxi and turnaround times, ideal for low cost operations. 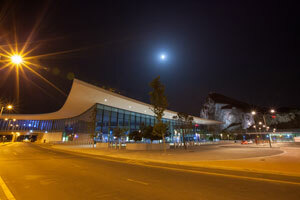 Completed at the end of Summer 2012, Gibraltar International Airports’ new terminal building showcases the airport as an entry point to the region. Spacious, light and friendly to navigate, it has all the facilities demanded by todays modern travellers. The Government of Gibraltar has invested heavily on improving the infrastructure to showcase Gibraltar International Airport as the entry point to a prosperous and growing economy, as well as welcoming air arrivals to this location full of history. 2012 passengers: 387,219 +1.1% on previous year.